In the wake of four-time IndyCar Series Champion and three-time Indianapolis 500 winning driver Dario Franchitti's forced retirement a month ago, the IndyCar driver market was spun into a frenzy. 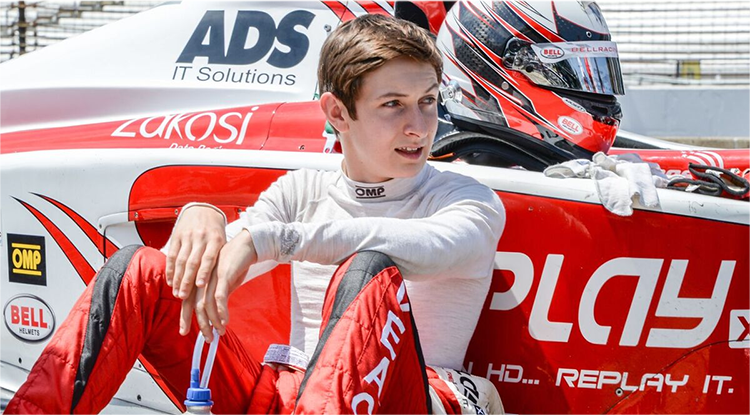 Rumored candidates from around the world included Formula 1, un-employed IndyCar drivers, employed IndyCar drivers and would-be rookies from the Indy Lights Series emerged, but team owner Chip Ganassi decided to promote from within. 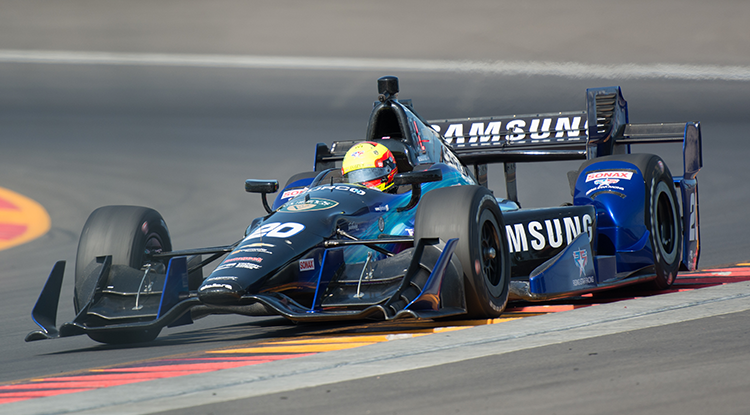 Ganassi moved Tony Kanaan, who was recently signed to pilot the team's #8 NTT DATA sponsored Chevrolet, up to the coveted Target #10 while re-signing two-time former CGR driver Ryan Briscoe to take over Kanaan's abandoned Dallara. Briscoe returns to the team in which he has driven for on two occasions. The Australian contested his rocky rookie season with the team in 2005 and returned last May to finish 12th in a one-off NTT DATA ride. Kanaan will team with defending series champion Scott Dixon in the Target stable while Briscoe joins race winner Charlie Kimball at Chip Ganassi Racing Teams. 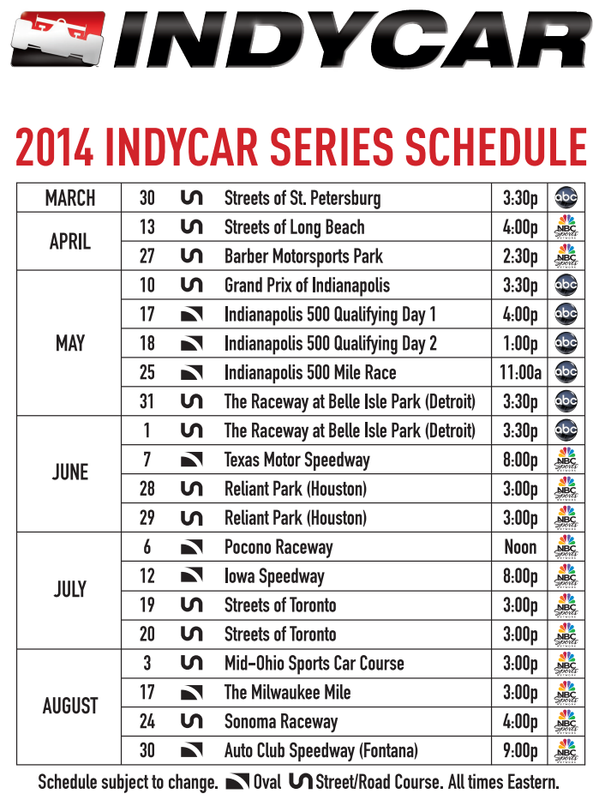 INDYCAR announced today the television schedule for the 2014 IndyCar Series season. The year kicks off in St. Petersburg on ABC before NBCSN takes over coverage leading into Indianapolis televising both the Long Beach and Barber Motorsports Park GPs. Open-wheel returns to ABC for the Inaugural Grand Prix of Indianapolis, both Indianapolis 500 qualifying days, The Indy 500, back-to-back events at Belle Isle. NBCSN picks back up at Texas and carries the series for the remaining 11 events. 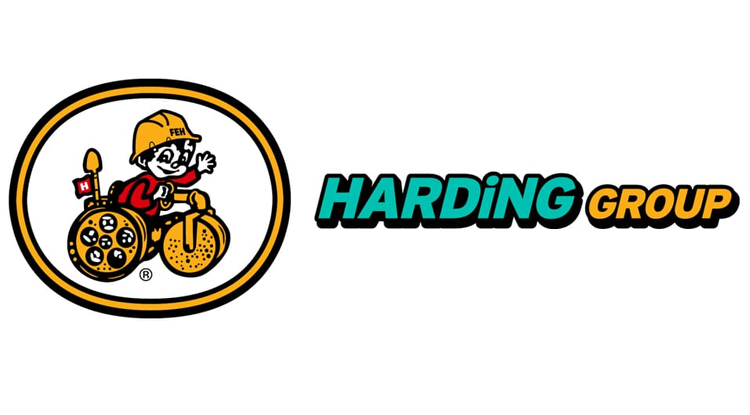 "The Indianapolis 500 has been an important property for our company for many years and the milestone of the 50th consecutive race on ABC is one that we plan to celebrate," said Julie Sobieski, ESPN vice president, league sports programming. "It's only fitting that our celebration also will include the new race on the Indianapolis road course and the drama of qualifications. "At the same time, we're also very happy to again be able to air the season opener from St. Petersburg as well as the doubleheader from Detroit. 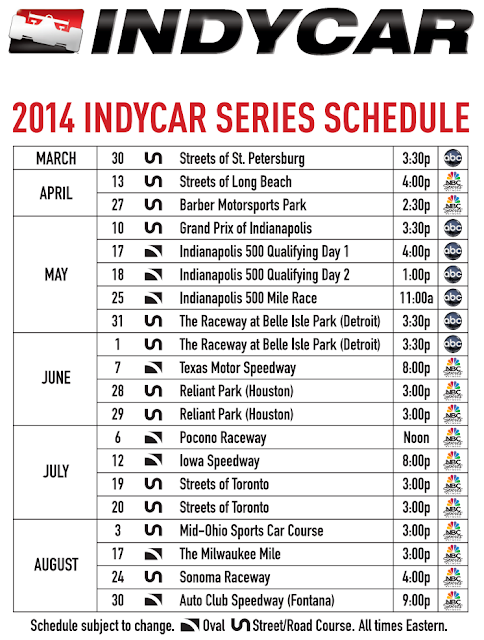 We look forward to an exciting season with the IndyCar Series and the Month of May at Indianapolis." In addition to the 13 races covered by NBCSN, the station will also air LIVE from IMS on Carb day. The group also announced that all races will be streamed live via NBC Sports Live Extra, NBC Sports Group’s live streaming product for desktops, mobile devices, and tablets. NBC Sports Live Extra – NBC Sports Group’s live streaming product for desktops, mobile devices, and tablets – will stream coverage of the 2014 IndyCar season via “TV Everywhere,” the media industry’s effort to make quality content available to authenticated customers both in and out of the home and on multiple platforms. Coverage airing on NBCSN will live stream to PCs, mobile devices and tablets through NBC Sports Live Extra, and to the digital platforms of participating cable, satellite, and telco services, via “TV Everywhere,” which is available on an authenticated basis to subscribers of participating MVPDs.